The Stoic Paradoxes is a short work written ‘during these shorter nights’ of the year 46BC. The work is comprised of six essays addressed to Marcus Brutus. I write this as a series of commentaries giving my thoughts on Ciecro’s reflections on each individual paradox. The translations of these Stoic Paradoxes was done by a C.R. Edmonds and from now on the rest of this article will be concerned with the first paradox. It had to be noted here though that Cicero himself was a man who possessed much of that ‘good and desirable things’ he was wealthy, possessed multiple villas, marble statues which he mentioned about while corresponding with his friend Atticus. He of all people knew about coveting riches and stashing them in his many villas and so must have rightly known that the craving for new luxuries and fashions are insatiable. Reading this I’m reminded of Schopenhauer’s comment on the individual as condemned in a state of ‘continual desire without satisfaction’ but of course this was known by the stoics thousands of years before. Luxuries but give us only a temporary satisfaction and yet even that is only achieved if peace of mind is a prerequisite factor. So then we reflect on this, would an individual suffering clinical depression gain greater satisfaction from getting a pay rise or say, being gifted with a 50inch ultra HD TV compared to another individual without a mental health problem receiving the same things in life? Can the possession of wealth make one virtuous? From this passage I cannot help but think of Marcus Licinius Crassus, the richest man of his time in ancient Rome who profited from the misfortunes of others. Here, some examples, Crassus acquiring the properties of Sulla’s victims, which were cheaply auctioned off or being Infamously known about Rome to take advantage of buying burnt and collapsed buildings when their property values plummeted only to rebuild them again with slave labour and this next one, how impious, he befriended Licinia, a priestess just in order to covet her property. I have not much else to say for this passage other than I understand the sentiment in which Cicero is coming from. And so onwards. Like La Mettrie, Cicero spoke highly of Bias of Priene, because during the sacking of his native Priene, Bias did not bother to take any of his material possessions with him while fleeing Prience and telling another the reason why he said “for I carry with me all my possessions” Think of a similar scenario in which possessions are destroyed such as in the event of a natural disaster like an earthquake. In a scenario like this I say that either we risk saving some of the movable property we possess with our life/health on the roulette or be safe and stomach the loss of property while adopting this virtuous state of mind. So would the latter action, Bias’ action and temperament, be recommended? especially if we do not have any other ethical approach to this situation? 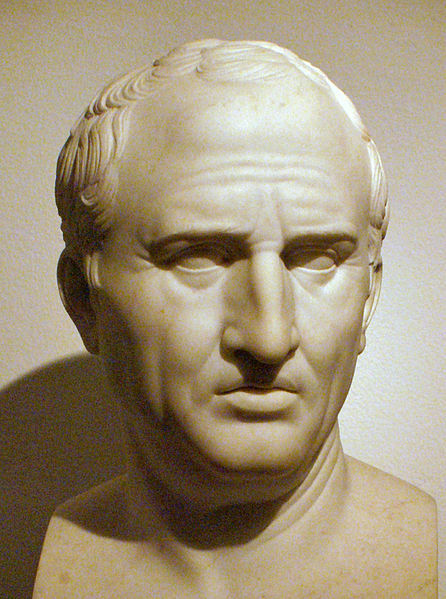 Our Cicero goes on to praise many other men that came after Romulus most prominently Publius and Gneius Scipio who, at risk of their own lives, campaigned to fight the Carthaginians. By their deeds did it make them glorious and noble or in short virtuous. Conclusion – what is more praiseworthy; virtue or possessing wealth and pleasure? The conclusion of the paradox is the most interesting and original part because here Cicero posits to us what makes a better man or what is more praiseworthy; virtue or the act of engaging in pleasure? So does the enjoyments of wealth or sensual gratification make you more praiseworthy? Is saying ‘I had the most delicious feast last night’ more praiseworthy than the act carried out by a fireman in saving the lives of people from an inferno? Is enjoying the pleasures of vacation abroad more praiseworthy than the work of a surgeon? Is sleeping with multiple partners often for another tally on the bed knob more praiseworthy than the squad commander taking a bullet for one of his troops? Is acquiring a sports car more praiseworthy than one who writes philosophy articles? Boasting about wealth and sensual gratifications often in return gives us not praise but envy and contempt. In Cicero’s eyes those that say pleasure is the highest good have the sentiment of that of a brute rather than that of a man. Living the stoic life, counter-intuitive it may well be (that is why it’s called a paradox! ), is the practise that will help us achieve a mind of inner peace.